Real estate investment has always been a game for the big dogs. With a high barrier-to-entry and a history of backroom deals and greasy palms, many investors would never even think of real estate investment as a viable option. Leave that for the big wigs, right? Like many forms of investing, that stigma is beginning to change in the digital age. The advent of real estate crowdfunding has opened up a whole new world for investors looking to get a foot in the door of large commercial developments, residential projects and more. So what is real estate crowdfunding all about, and how does it work? Read on to find out. Real estate crowdfunding is when real estate projects are allowed to be partially or wholly funded by individual investors, who have just recently gained the right to invest in these kinds of projects. Like other forms of crowdfunding, real estate crowdfunding is a new invention. The JOBS act in 2012 helped pave the way for crowdfunding in real estate, but unfortunately for eager investors, there are rules on who can participate. You have to have a net worth of at least $1 million, not including your primary residence. Don’t have that much in assets? You have to earn at least $200,000. Those high barriers mean real estate crowdfunding is not something the lay investor will have access to – at least not right away. However, it does give millions more people access to one of the most secretive aspects of investing. It also allows companies to fund their goals without going through the more formal rounds of fundraising. When you invest via a real estate crowdfunding platform, you become a limited partner in the investment- which can vary by project. You really need to look at the project when deciding. Some projects are debt-based, meaning that you are providing a loan that is secured by the property. Some projects are debt-based, but you’re actually investing in a third-party note tied to the performance of the underlying real estate investment. Some projects are equity-based, which means you are investing in a fund, such as a REIT, which holds a property or multiple properties and you’ll receive cash flow as well as some of the upside in appreciation. Many companies only require a $5,000 minimum investment in a project, so the barrier to entry is relatively low. The companies also charge fees of up to 3%, which may be a shock for those used to investing in low-cost mutual funds and ETFs. You may not see these fees directly, since they are typically paid out of the return prior to paying you. Making money in real estate crowdfunding, like any type of investment, requires doing a lot of research. $5,000 may not be much for some people, but the smaller investors who will benefit the most from real estate crowdfunding need to contribute carefully. Every investment varies – some guarantee a minimum return, some don’t. You really need to read the fine print before investing. It also helps to only invest money that you can afford to lose. This is partly why only accredited investors are currently allowed to participate in real estate crowdfunding. Some companies let investors put as little as $5,000 into a project. If you’re not completely sure about a firm’s prospects but still want to invest, investing a small amount may be the best option. Fundrise – One of the most popular real estate crowdfunding sites, Fundrise has a minimum investment of $1,000 and charges between 0-3% in fees. The site is ruthless about which projects it accepts – only about 5% of proposals are chosen. Fundrise is another one of our favorite sites simply because of the range of investment properties they have to choose from, but also because you don’t have to be an accredited investor to invest – they are one of the only platforms that allows this currently. Check out our Fundrise review here. Realty Mogul – Investors who use Realty Mogul have the flexibility to put as little as $5,000 down, but can also participate in large-scale projects – such as the Hard Rock Hotel in Palm Springs. People can fund real estate loans or buy an equity share in a property. RoofStock – RoofStock is a company that allows investors to purchase single family rentals that are already occupied. Beyond having a great marketplace, they offer a lot of add-on services like management that makes investing in single family rentals extremely easy. Check out our full Roofstock review here. Equity Multiple – Equity Multiple is a platform where you can invest in pre-vetted projects from investors looking to raise money. These investments can be in preferred equity, debt, or regular equity. PeerStreet – PeerStreet has become the most “famous’ real estate peer to peer lender, with the endorsement of several major finance personalities. They use a data-driven approach and focus exclusively on debt financing. PeerStreet also currently has the lowest investment minimum at just $1,000. Check out our full PeerStreet review here. If you’re an accredited investor and are looking to get into real estate, P2P real estate investing is something that you should consider. It’s very easy to get started – but just like traditional real estate investing, it is higher risk for higher reward. If you’re willing to accept that higher risk, check out these platforms. 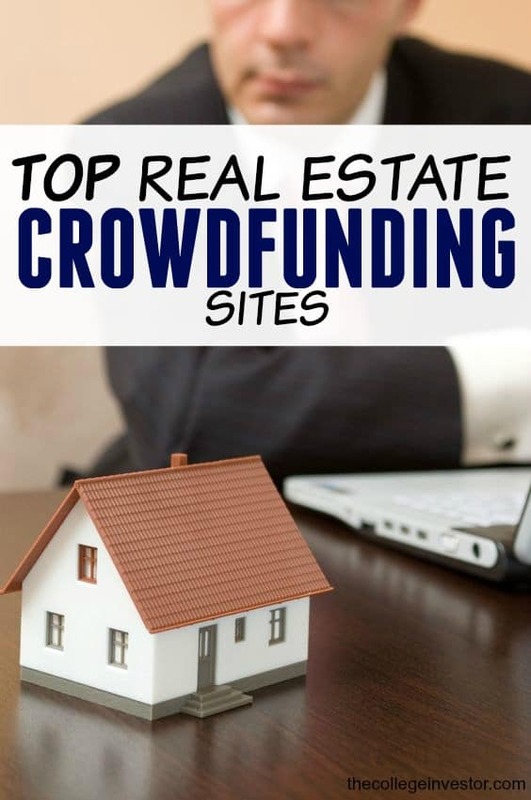 Have you had a good experience with any of these real estate crowdfunding sites? They are all in that range – $1,000 to $5,000 minimums. Great way to get into real estate if you’re considering it. Sharestates.com actually has investment minimums of $1,000 with average net annual returns of 11.37% for 2016. I’m looking for the best platform for smaller real estate purchases. Depending on the property I may fix and flip, or rent and hold. I do believe there are some pretty straightforward formulas to buying a profitable single and multi-family home. What I’m having trouble finding is a Crowdfunding site for projects under $100k. I’ve done about a dozen projects in the last 15 years ($5k – $600k) or so and know that it isn’t a passive business but does take skill and work to make a profit. Any insight on what crowdfunding site to use to find investors for smaller projects? On RealtyShares, I’ve seen deals at less than $100k – typically single family properties. I’ve seen the same on some of the other platforms as well. What are the best crowdfunds for real estate in Canada? Sadly this isn’t a thing in Canada.